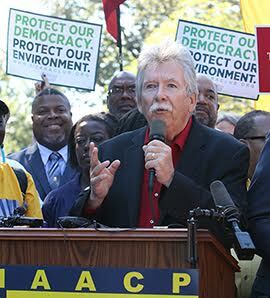 WASHINGTON (PAI) – Urged on by union leaders, civil rights leaders and sympathetic lawmakers, more than 1,000 people – including hundreds of unionists – descended on Congress on Sept. 16 to demand lawmakers restore and strengthen the Voting Rights Act. 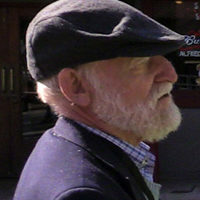 The lobbying followed a mass rally that morning on Capitol Hill, organized by the Democracy Initiative, a 51-group coalition created by Larry Cohen when he led the Communications Workers. Speakers, including Cohen declared that without the right to vote, other rights – including workers’ rights – are meaningless. The rally was the culmination of a months-long march of unionists, civil rights activists, clergy – including 200 rabbis carrying a Torah on the Jewish holidays-environmentalists and others from Selma, Ala., to D.C., demanding restoration and improvement of the law. They all demanded lawmakers approve the Voting Rights Advancement Act, legislation introduced in June to overturn the two-year-old U.S. Supreme Court ruling, on the usual 5-4 partisan vote, that gutted the enforcement sections of the landmark 1965 Voting Rights Act. Unionists at the rally, from the Communications Workers, the Government Employees, AFSCME, the Teachers, the Office and Professional Employees, UFCW, the AFL-CIO, the Postal Workers, the Amalgamated Transit Union and the Service Employees, headed for the halls of Congress to explain the issue and demand action, not just supportive statements. The NAACP provided a huge contingent of marchers, with many coming all the way from Selma. Environmentalists, other civil rights groups, and lesbian-gay-bisexual-transgender groups were among the others at the rally. All of those groups headed inside to lobby, too. Several of the speakers vowed that if solons did not act now, marchers would be back, with sit-ins and risking arrest, just as the original civil rights marchers crusaded, sat in and were arrested 50 or more years ago. “We will continue to work, we will continue to fight, we will continue to march until we have justice, the right to vote and democracy in our country,” Cohen declared. “We will mobilize millions.” Waiting until 2017 or 2018 to pass the legislation is unacceptable, he said. “We care about workers’ rights, which are in a shambles and are a disgrace, but we can’t win these fights if 30 million people can’t vote,” he added. The legislation, introduced by top Democrats on committees that handle civil rights bills and Congressional Black Caucus members, just picked up its first GOP backer, Sen. Lisa Murkowski, R-Alaska, one speaker said. It also would outlaw so-called “voter ID” laws that curb or ban voting by African-Americans, women, Latinos, workers, students, the elderly and others. And it would extend Justice Department oversight and pre-clearance of jurisdictions with history of discrimination, while extending the Voting Rights Act to cover Native Americans, too. But the measure faces hostility from Congress’ ruling Republicans, especially from House Judiciary Committee Chairman Robert Goodlatte, R-Va. “There is a crime in those buildings,” said the Rev. Dr. William J. Barber II, creator and leader of North Carolina’s Moral Monday marches and movement, as he gestured to the U.S. Capitol and solons’ office buildings. “Power concedes nothing without a struggle,” warned Rep. Terri Sewell, D-Ala., a co-sponsor. Her congressional district includes Selma, Montgomery and Birmingham. That’s “because when you allow extremists, Republican or Democrat, to steal elections, it’s a crime against democracy,” Barber declared. “The only major nation trying to restrict the right to vote is the United States of America,” added supportive Sen. Mark Warner, D-Va., referring to the restrictive so-called “Voter ID” laws the Supreme Court approved several years ago and that many states have since passed. Those states, including Indiana, Texas, Alabama and North Carolina, are virtually all GOP-run. Cohen’s successor, current Communications Workers President Chris Shelton, said “the other side has all the weapons” in “a class war” against minorities, women and workers. “The Supreme Court has said corporations are people, and taken away our weapon, the right to vote. Are you ready to take that weapon back?” he asked the crowd. “Yes!” was the roared reply. “No matter what anybody’s issues are, we will never be able to fix them unless every goddamn American has the right to vote!” Shelton exclaimed. “Without voting rights, we have no union rights and we have no marriage rights,” said AFT President Randi Weingarten. She particularly appealed to religious leaders and people to join the campaign to restore and strengthen the Voting Rights Act. Now is an opportune time to do so, “since the Pope is coming to town,” the Jewish New Year has begun and Moslems are observing religious holidays as well, Weingarten noted. Photo: CWA President Chris Shelton fires up the crowd at the voting rights rally.